I hadn’t really thought about why too much salt in the soil is bad for plants until I found a video teaching me all about the osmosis of water due to salt gradients. In this video I attempt to recreate the original demonstration with a couple of other additions – For Science! I ended up doing two similar versions. One with the cooked and uncooked potatoes and salty insides and one with uncooked potatoes in briny water. Below are the steps for both versions. Begin by selecting at least one of your potatoes to be cooked. If your potatoes are relatively small you may wish to cook a second one. I chose to boil mine for simplicity but whatever means you choose if fine so long as the potato is fully cooked but still relatively firm. That way you will be able to cut a hole in it later. Once the potato is cooked and cooled remove the skin. I used the potato peeled on the cooked potato which didn’t work very well because the cooked flesh stuck to the peeler a lot, but it got the job done. Now peel the uncooked potato(es). Next cut the cooked potato and uncooked potato in half. The goal is for four pieces, two cooked and two uncooked. If your potatoes are smaller you may just want to cut the top off so there will be a convenient place for the hole later. Carefully scoop out a small hole on the top side of each potato piece. Both cooked and uncooked. I made mine a bit deep the first time, they probably should be a bit more closer to the second version. Take a paper towel and pat both the cooked and uncooked potato pieces dry. This will make it easier to see when water moves into or out of the holes. Next pour or scoop a generous heap of salt into the middle of ne of the cooked potatoes and one of the uncooked potatoes, leaving the other two empty. Now place the four pieces into the large flat bowl (tupperware) and carefully, so as not to tip any over, fill up the container until the potato pieces are half submerged. Monitor the cavities within each potato piece for 1 to 3 hours. And observe what movement of water there is. Begin by peeling one large potato or two smaller ones. Cut in half (or cut off one side for smaller potatoes). Carefully scoop out a small hole on the top side of each potato piece. In a mixing bowl or cup take about a quart of water and add to it 3-5 tablespoons of salt to make a briny mixture. Mix thoroughly for about a minute. It’s okay if there is a little salt that doesn’t dissolve. Carefully place both potato pieces into the bottom of a flat bottomed bowel. Next pour the briny salt into around the potato pieces. 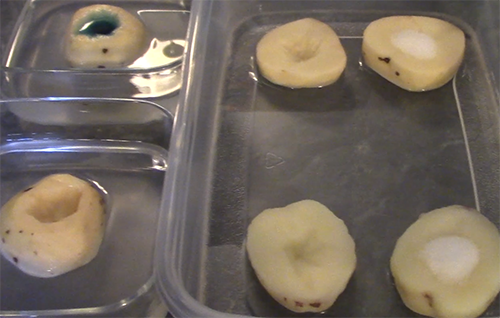 Now carefully drip or pour a small amount of freshwater into the hole of one potato. Drip one drop of food coloring into the water inside to make it easier to see the water level (optional). You can also try steps 1-10 with a cooked potato as well. I only thought of this after I was done editing the main video – but what do you think would happen? These images were from the second 2 hour round only, since the first round was not adequately recorded and only had images from the end of the 3 hour run. In both attempts that I made there was some transport of water into the salt pile for the cooked potato as well as the uncooked potato. However in both runs of the experiment there was significantly more water pulled into the salt pile for the live potato. So much so that the water began to overflow the pocket and dribble back out into the tray. In neither version of the experiment did any water move into the pieces with no salt added during the 3 hours for the first experiment and the 2 hours of the second experiment. For the briny water setup about half the water that was placed into the hole uncooked potato was drawn away. Perhaps I should have also placed a small cup of water next to the potato to demonstrate that this change in water level was not due to evaporation. Likewise I have since thought of several other variations of briny and fresh water and cooked and uncooked potatoes. I was also surprised to find that the potatoes in the briny water became flaccid or slightly squishy. In hind sight this makes sense because the cells will be less stiff as the water is drawn out of them. I also found some other similar experiments where lengths of potato are placed systematically into water with varying salinity and then measured to see how flaccid or turgid they become (see links below if interested). While these are more quantitative than my experiment I feel the qualitative nature of my version gives a clearer sense of the underlying mechanism. Previous How to prove there is Iodine in Salt!